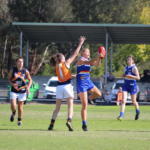 TWO triple headers headline the first ever round of NAB League Girls as the 12 teams begin their 2019 campaigns hoping to get their season off on the right foot. In what is predicted to be a sweltering day at RAMS Arena, the first match in the triple header is the Calder Cannons taking on the Western Jets. Both sides are bringing in some strong depth making it an interesting game to see which team can kickstart its season first. 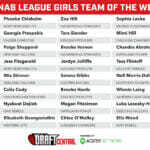 The Cannons will be without Georgia Patrikios, but have the likes of Alana Barba, Felicity Theodore and former Gippsland Power player, Makeisha Muller. 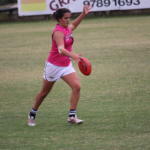 Georgie Prespakis is one to watch for the future, and while older sister Madison is no longer there to lead the team, the Cannons will have Krstel Petrevski coming off half-back and is a player the Cannons are excited to develop throughout the season. For the Jets, they have a number of top prospects who are members of the AFL Women’s Academy at both the top and middle-age brackets. 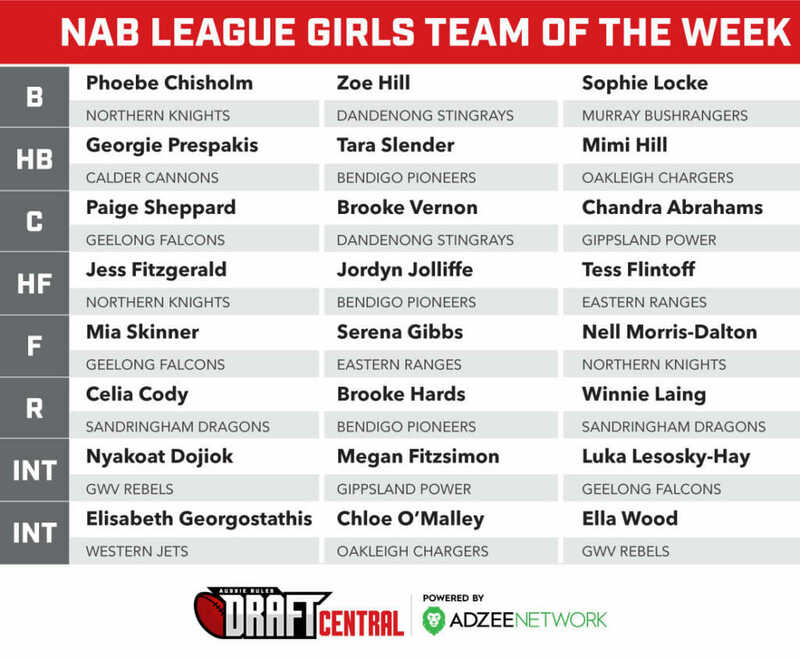 Isabella Grant and Cleo Saxon-Jones are strong overhead and can kick goals when forward, while Isabelle Pritchard still has two years in the system and is shaping as a highly talented key defender. Elisabeth Georgostathis is the other player who put in a consistent 2018 season, named onball like she was last year where she won the Jet’s best and fairest award. The second game sees two country neighbours battling it out in what could be a thrilling contest. The teams have had productive pre-seasons and the Pioneers had no trouble scoring in their practice match against the Bushrangers, while the Rebels were pleased with their efforts against the Falcons. The defensive duo of Kate Douglass and Tara Slender will be one to watch and assist in restricting opposition teams from scoring, while Jordyn Jolliffe‘s return from injury – she missed all of last season’s TAC Cup Girls competition – will be welcome and she starts at full-forward. 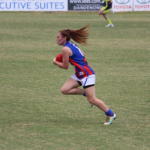 The midfield group of the Pioneers is quite strong and will have benefited from another year, with the likes of Brooke Hards – who played some roles in defence last season – Eloise Gretgrix and Jemma Finning, while Maeve Tupper was predominantly a forward pocket last season and will spend more time in the midfield. Sophie Molan and Ella Wood will lead a deep Rebels midfield in what will be the battle of the midfields within the match. Isabella Simmons developed strongly as the season went on last year, while Renee Saulitis and Isabella Robson are other middle-age talents in the team. In the final game of Saturday’s triple header with the temperatures expected to be high 30s by the final siren, the two teams who finished second in the first two years face off from 12.45pm. The Knights head into the game as strong favourites based on the form they showed last season, and they have a number of talented players in each third of the ground. The midfield features Ellie McKenzie, Jess Fitzgerald and Britney Gutknecht, with the likes of Gabby Newton and Abigail Bennett rotating between the midfield and forward. Sarah Sansonetti and Ash Snow are a couple of defenders who impressed last season, while Alyssa Bannan developed rapidly in 2018. For the Bushrangers, Olivia Barber has been named at centre half-back and could be the one to try and quell Newton, while forwards, Sophie Locke and Kate Adams could do some damage if given time and space. Mikaela Trethowan is a 19-year-old prospect who will provide good support in the midfield, while Emily Nicholson is another player who played every game last season and will be well prepared for the first round match. The game is a huge challenge for the Bushrangers against the likely premiership favourites, but it will be a good test to see where they are at, and how the Knights have changed with players tested in other positions. In the first game of a triple header at Frankston on Sunday, Dandenong Stingrays will be looking for their fifth straight win after finishing the season in a blaze of glory following four early season losses. Recent St Kilda recruit, Isabella Shannon has been named at centre half-forward and will be a player to watch for any Saints fans who head down to the game. While fellow Saints teammate, Molly McDonald will not be out there, Brooke Vernon, Tyanna Smith and Grace Hodder will lead the charge in the middle. Zoe Hill stands tall at centre half-back and while partner-in-crime Lucy Cripps will not be out there, Hill will aim to try and nullify one of Eastern’s talls. That could be netballer, Serena Gibbs or AFL Women’s Academy member, Laura McClelland who could rotate between midfield and forward. The forward line and particularly midfield looks solid for the Ranges, with Olivia Meagher and Tahni Brown among the middle-agers who still have a couple of seasons to develop. Both teams are likely to create a lively contest. The middle game on Sunday will see two teams that faced off in Round 1 last year do battle once again with Oakleigh Chargers facing Gippsland Power. The Chargers won easily 12 months ago and will be hoping to serve a repeat dose, while the Power feel more prepared to tackle the Chargers this time around. Middle-age captain, Mimi Hill leads a band of quick defenders who like to move the ball well, as Chloe O’Malley and Nicola Xenos showed last season. Gemma Lagioia and Emily Harley inside 50 will provide any opposition coach problems, as would Alana Porter‘s speed through the middle of the ground. The club is excited to release Amelia Peck on the competition with the 19-year-old named at centre half-back. Gippsland will miss Tyla Hanks in the middle, but have been able to supply a number of players with a season of experience and now there are top and middle-agers with a taste of the competition already. Nikia Webber and Matilda Van Berkel line up in the key forward posts, while Chandra Abrahams, Megan Fitzsimon and Grace McRae fill out the midfield. Maddi Shaw and Shanara Notman are others who could be key players in the game, providing strength and run from defence. In the final game of the round, Sandringham Dragons face Geelong Falcons on Sunday afternoon. The reigning premiers will test themselves against a danger side in the 2019 competition. Both teams are in the form of their lives having not lost a game in the past six regular season rounds – and even longer for the Falcons. The midfield battle will be one to savour with Dragons’ captain Molly Denahy Maloney, Alice Burke and Eliza McNamara tackling the likes of Falcons’ captain Lucy McEvoy, Luka Lesosky-Hay and Paige Sheppard. 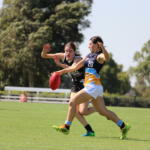 Both sides have a highly touted key defender in Sarah Hartwig (Sandringham) and Abbey Chapman (Geelong), have speedy wingers in Marguerite Purcell (Sandringham) and Elise Vella (Geelong) and forwards who can take big grabs, Sophia Rothfield (Sandringham) and Renee Tierney (Geelong). With both sides having a high amount of talent coming through at middle and bottom-age level, they are going to be teams to watch this season. Round 1 may well have saved the best until last, and the final game of the new NAB League Girls will likely be a match to remember. SIX NSW/ACT players will represent the World Team and Flying Boomerangs in July, while Canberra Demons scooped their first win in the NEAFL, and Sydney University continued their winning run with victory over Northern Territory Thunder. 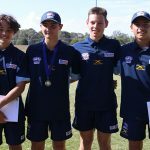 After a great experience at the 2018 AFL National Diversity Championships, six players from the NSW/ACT All Nations and Kickstart squads were selected to represent the World Team and Flying Boomerangs. NSW/ACT’s All Nations’ Most Valuable Player (MVP) Thomas Sase was selected to represent the World Team along with teammates Harry Wichman, Oliver Kozak and William Sabolch. NSW/ACT’s Kickstart MVP award winner Kai Watts made the Flying Boomerangs team with Hunter McAuliffe. The representatives will take part in two exhibition matches in July at the National Under 16s Championships. The squads for the two exhibition matches were named last week. For all the information on the 2018 AFL National Diversity Championships, head to the AFL NSW/ACT website or Facebook page. The NSW/ACT Youth Girls squad to take on Tasmania in two matches in June, was finalised yesterday with 23 players from across the state and territory. The squad which was named on the NSW/ACT website, is highlighted by plenty of strong local talent. Female Football Pathway Manager Ash Moeller named AFLW Academy member Alyce Parker, Georgia Breward and Brianna McFarlane as three players to watch throughout the series. TAC Cup spectators will keep a close eye on how Eloise Ashley-Cooper goes, with the Finley prospect performing well for the Murray Bushrangers, while Bendigo Pioneers’ Jordyn Jolliffe will miss the June competition. The first match will be played on Friday, June 1 at 7pm, with the the second game to come two days later on Sunday, June 3 at 10am. Both matches will take place at Blacktown International Sportspark. 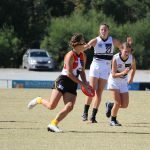 From these games, a combined NSW/ACT and Tasmanian side will be formed to create the Eastern Allies, which will compete at the National AFL Under 18 Women’s Championships in July. Canberra Demons have kick-started their 2018 North Eastern Australian Football League (NEAFL) season with a bang in round three, destroying Redland by 83 points in a demolition of the Queensland side. The Demons booted four goals to zero in the opening term, missing some opportunities with 11 scoring shots to one. They started to capitalise in the second term with 5.2 to 3.1 to open up a 43-point advantage at the main break. In the third quarter the Demons completely dominated with a further eight goals to two to lead by an impressive 81 points, before an even final term saw Redland keep the damage to just an additional two points by the final siren. Remarkably, former Brisbane AFL-listed player Matt Hammelmann booted six goals for Bombers, but Canberra’s attack had more potency with 11 individual goal kickers including Luke McKay (five), Aaron Bruce (three), while five players finished with two majors. Among them was Mitch Maguire (27 disposals, six marks, two tackles and two goals) who was named his team’s best for yet another week, along with Bruce (21 disposals, 13 marks and seven tackles), Sam Martyn (27 disposals and eight marks) and Lucas Meline (21 disposals, eight marks and one goal). Meanwhile Angus Baker took out the NEAFL Rising Star nomination for round three for his 22 disposals, four marks, six inside 50s and two tackles. 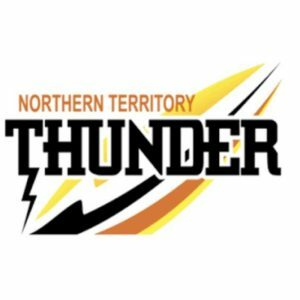 Sydney University has extended its unbeaten streak to start the 2018 season with a 15-point victory over previously undefeated side, Northern Territory Thunder. The Thunder got a head start in the opening term with four goals to three to lead by nine points at quarter time. Sydney University hit the front late in the second term with three goals to two, to head into the main break with a one-point advantage. They maintained their lead heading into the final term with an impressive six goals to four third term, before holding on as both sides booted two goals in the final term for the victory to remain second on the table. Sydney University had 10 individual goal kickers in the victory, with Jack Hiscox, Montgomery Krochmal, Lewis Stevenson and Matthew Wilson all booting two goals. Shaun Edwards was named best on ground for his performance, picking up 23 disposals, three marks and booting a goal, while Stevenson had 30 disposals, six marks, three tackles and booted two goals. Tom Young was also prominent with 28 disposals, five marks, four tackles and a goal. Sam Tagliabue was also solid in the ruck with 31 hitouts to go with 12 disposals, two marks and five tackles.